Chapungu Tented Camp is a 4 star lodge situated in the Thornybush Private Game Reserve, in the Greater Kruger National Park. This vast African wilderness is home to Africa’s Big Five and a wide variety of bird and other mammal species – giving the traveller amazing opportunities to get up close to the big cats, the largest mammal on earth, the Elephant and over 250 different species of birds. Chapungu Luxury Tented Camp is furnished in colonial style, with handpicked pieces filling the lodge. Comprising of just 8 Air-conditioned en -suite tents overlooking the vast bushveld, guests will enjoy their time on safari in true African Style. Relaxing and enjoying the tranquility and intimacy provided by this small camp – ensures a safari of a lifetime. Chapungu Luxury Tented Camp comprises of 8 en-suite luxury tents. The camp accommodates a maximum of ten guests. Overhead ceiling fans and air-conditioners in all tents and suite. Rock pool – perfect for relaxing and cooling off in mid-day. Elevated viewing deck at lodge water hole. Curio shop, Boma, and dining area. Enjoy scenic views from the vantage of the elevated deck with an active water hole in close proximity. Whether it is around the fire in the boma or from the classically appointed dining room, savor Chapungu’s culinary delights. Dinners are five courses and complimented by superb South African wines. This home from home experience will see every guest leave as a friend. Boma dinners are a special occasion and an opportunity to select a bottle from the stock of fine wines and to savor the delicious fare around a log fire as you recount the day’s game experiences before retiring to the lounge for a night cap, or to the comfort of your tent. Game drives are undertaken in open safari vehicles every morning and evening with the camp’s highly trained rangers and trackers. 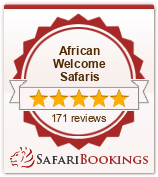 Walking safaris can also be arranged. At the end of the day, a hearty bushveld dinner is taken at the open boma next to the pool where one can relax by the crackling campfire, listening to the night sounds of Africa as the animals come to drink at the floodlit waterhole. The staff take great pleasure in sharing with you their passion for hospitality and the excitement of dawn and dusk safaris in open Land Rovers, ensuring close and unrestricted encounters with the Thornybush wildlife. Enjoy the gentle nurturing of an Elephant calf by its mother or a close encounter with a Lioness and her cubs. The more adventurous are encouraged to join the experienced game ranger on a walk as he interprets Africa’s footprint.